Discover how to use the 7-Point check-up system to gauge the health of your team and take action steps to ensure you and your team are growing this year. 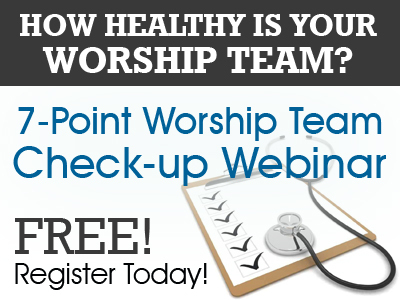 Complete the form below for instant access to the FREE Worship Team Check-up Webinar. It comes around every 7 days . . . Your Worship Service! Do you feel stress in planning your worship services? Do you struggle to plan worship services more than one week ahead? Do you feel like you are missing out on God’s best for your service because it comes together at the last minute? Do you ever feel underprepared for Sunday? For many pastors and worship leaders the worship service is simultaneously their greatest source of joy in ministry, AND their great source of stress. IN THIS NEW 75-MINUTE WEBINAR, you can discover how to overcome the Top 3 Worship Planning Mistakes that are keeping your worship services from being truly life transformational . . . all while lowering the stress of worship planning each week. 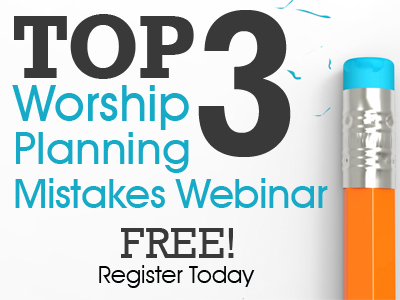 Complete the form below for instant access to the FREE Top 3 Worship Planning Mistakes Webinar.